You are here: Home ∼ THE DESIGNATED HITTER TURNS 46! When Orlando Cepeda agreed to a one-year contract with the Red Sox on January 18, 1973, he became the first major league player signed expressly to become a designated hitter under the new American League rule. A veteran slugger with 15 major league seasons behind him, Orlando had been hobbled by painful knee injuries for several seasons, and he was ideally suited to perform exclusively as a hitter. Cepeda was a long-time National Leaguer but he was no stranger to Red Sox fans. In 1967, Cepeda’s offense had led the St. Louis Cardinals to the National Pennant and into the World Series against the Impossible Dream Red Sox team. Orlando Cepeda was elected to Baseball’s Hall of Fame by the Veterans Committee in 1999. For long-time Red Sox fans, he will always be remembered as our first designated hitter. Orlando Cepeda was born in Ponce, Puerto Rico, on September 17, 1937. His father, Perucho, was an outstanding shortstop in the Puerto Rican Winter League. Perucho was such an accomplished power hitter that he was often referred to as “The Babe Ruth of the Caribbean” and his nickname was The Bull. Orlando was signed by the Giants at age 17, and he began a quick assent through their minor league system. Each winter he played in the Puerto Rican Winter League, and his emerging power earned him his nickname “The Baby Bull.” By age 19, he had reached the Triple-A level where he hit 25 home runs and drove in 108 runs for the Minneapolis Millers. Orlando Cepeda arrived at the Giant’s spring training camp in 1958 as a non-roster player and left as their starting first baseman. Adding to the excitement for the 20 year-old was the Giants’ move to San Francisco after 75 seasons in New York. The Bay Area embraced the Giants immediately and welcomed All-Star Willie Mays enthusiastically. But it was the rookie Orlando Cepeda who stole their hearts from day one. The Baby Bull homered against the Dodgers on Opening Day and Giant fans embraced him as their first home-grown star. In his first MLB season Orlando was a unanimous choice as the National League Rookie-of-the-Year for 1958. He continued as an offensive force with the Giants for eight full seasons, but in May 1966, he was traded to the St. Louis Cardinals. Orlando Cepeda adjusted quickly to his new surroundings in 1966, and the following year it was clear that he had found a new home on and off the field. St. Louis won the National league pennant with ease and Cepeda was the unanimous choice as league MVP. Going into the 1967 World Series, Red Sox scouts told pitchers that Orlando was the one guy they had to shut down. But Orlando went 0-4 against Jose Santiago in the opener, and Red Sox pitching held him to a .103 average during the hard-fought seven game series. Cepeda had a down year in 1968, and the Cardinals traded him to the Atlanta Braves before the 1969 season. Orlando bounce back with the Braves but by 1971, ongoing problems with his right knee caught up with him. When he injured his left knee in 1972, it appeared that his career was over. At the end of the 1973 season Orlando Cepeda ranked among the Red Sox offensive leaders in most categories. Despite his balky knees he was tied with Carl Yastrzemski for the team lead in doubles (25). His strong showing earned him Designated Hitter of the Year honors, and he finished 15th in the AL MVP race. Orlando Cepeda is recalled for his power-hitting in 1973, but it was his role in the clubhouse that leaves a lasting memory. Peter Gammons wrote, “Everywhere that Cha Cha [his nickname since he broke in with the Giants] goes he is surrounded by music. ‘I have more than 7,500 records. To be ready for the game, to concentrate, you have to relax’” Cepeda told Gammons. And Orlando felt that Boston was a friendly city. “I made some really good friends in Boston. 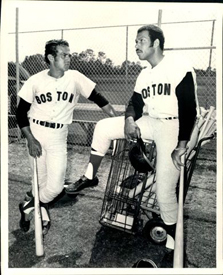 Buddy Le Roux [Red Sox trainer at the time] was a really good friend. This is the last town I’m playing in. When the Red Sox feel they don’t need me and I can’t play any more, I will retire,” Orlando said. In 1987, Orlando Cepeda rejoined his first major league baseball team, the San Francisco Giants. He did some scouting for the team and then shifted to professional development. Over time he became a goodwill ambassador for the Giants and a leading community relations spokesperson. In 2008, the Giants erected a nine-foot statue in his honor outside of AT&TPark. His statue stands alongside the statues of Giants’ greats Willie Mays, Juan Marichal and Willie McCovey. San Francisco has fully embraced their first home-grown baseball star.